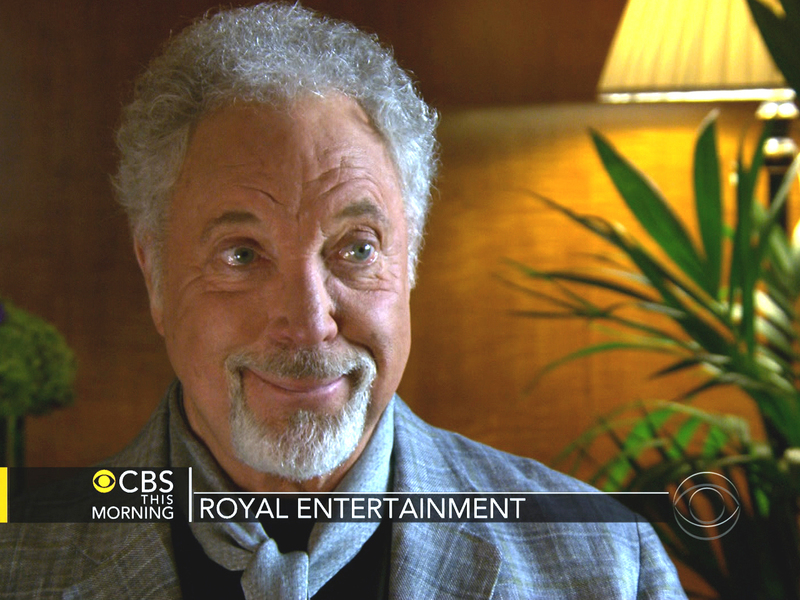 (CBS News) For the second time in his storied career, Sir Tom Jones will perform Monday night for Her Majesty at a star-studded concert marking the queen's 60 years on the throne. His fellow knights, Paul McCartney and Elton John, will also be there. Jones said the Jubilee concert is a "once-in-a-lifetime" honor. He performed at the back of Buckingham Palace 10 years ago, but said with a laugh that he's finally made it to the front door. "When you get a royal wedding or a Jubilee - and it brings people together, you see happiness on people's faces," he said. "... It's very exciting. It's a wonderful thing." Jones was Las Vegas nobility for decades, but he became the real thing when Queen Elizabeth II dubbed him a knight of the British Empire in 2006. Jones said he was "shook up a little" when he first learned he would be knighted. "Once I felt the sword on my shoulders it was all - it all came to reality. And it was a wonderful feeling and still is. It's a great honor." Jones said he and the queen spoke briefly during the knighting. The queen said he'd given people a lot of pleasure with his music for many years. Jones said he replied, "'I've had a lot of pleasure doing it, Your Majesty.' And she said that, 'Well, I'm sure you have.'" "Her face lit up when she was speaking to me. And I liked that," Jones said. "You know, I put a smile on her face." So is the queen a Tom Jones fan? "I hope so," Jones said. "She has never said that. But I think so." The queen would be in good company. For nearly as long as the queen has occupied the British throne, Jones has occupied the hearts of the British people. Jones has sold more than 100 million albums in his career. But early in his career, he said he "exploded" onto the music scene. "There I was on British television with The Beatles and The Stones, you know, I was on those shows with them, you know. Then I went to America in the same year to do an 'Ed Sullivan Show'...and then I was meeting Elvis Presley andFrank Sinatra and Sammy Davis. And, you know, I thought, 'My god.' And it happened very quickly. I was meeting these people early. So I thought, 'Wow,' you know, 'I haven't just broken through. I've like exploded.'" Jones, the son of a Welsh coal miner, headed west in the late '60s and took up residency in Las Vegas clubs. His sound, style, and moves were forever linked with Sin City. "I was just having a great time," Jones said. "I was singing songs that I loved to sing. And I might've been a little too outrageous. I don't know, you know with my persona. So sometimes things happen without you realizing it. And you get tagged with certain things. I think my image overshadowed my talent." When asked if he could be where he is now without going through all of those things, Jones said, "No. You have to experience things. And that's what you should learn, you know, you should learn from it, and by it and add to it, and become a better singer and I think you have to live in order to sing certain songs." Jones' new album, "Spirit in the Room," reflects that philosophy. The collection of stripped-down soulful covers offers a window into an artist clearly entering his best stage yet. The Leonard Cohen song, "Tower of Song," has lyrics that seem to be fitting for where he is these days. He said, "I wouldn't have been able to sing it 40 or 50 years ago when I there's things that I can sing now that maybe wouldn't have been so important or would've rang so true years ago, not the ones I'm doing now. There's a feeling of accomplishment when you've been in business for any length of time. The feeling is slightly different to what it was when you first start. But I'm exploring all the time. I'm always learning. I don't think you're never too old to learn about music and explore different part of your voice that maybe I hadn't done before. Like the Leonard Cohen songs says, 'But there's still wonderful things to experience.'"